Back in early September this Elephant Hawkmoth caterpillar was happily making its way across our vegetable garden when it bumped into one of our cat’s paws! Luckily I was on hand to rescue it before Holly managed to play with it and cause it any harm. The Elephant Hawkmoth derives its name from the long, trunk-like nose that it has as a caterpillar. 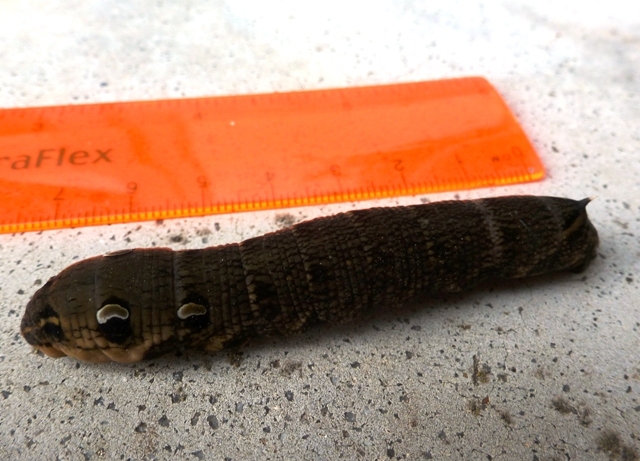 Measuring about 75mm in length it is easily the biggest caterpillar I’ve ever come across. The Elephant Hawkmoth caterpillar is often seen between August and September moving quickly across open ground as they look for somewhere to pupate. 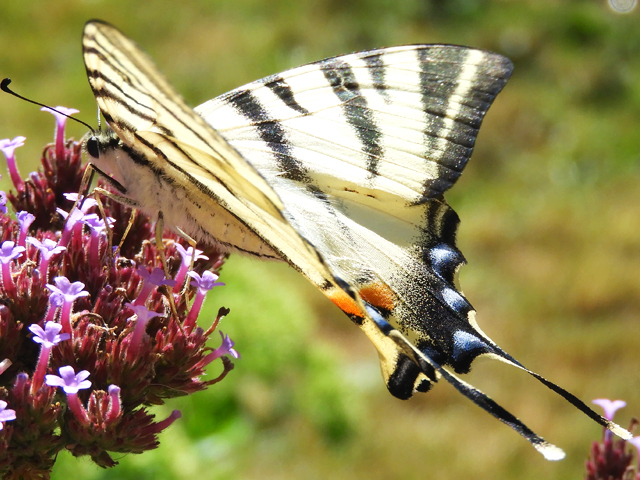 The caterpillars feed on bedstraw, willowherb and fuscia. They pupate from September through to the following May when the adult moth then emerges and can be seen flying throughout early summer. 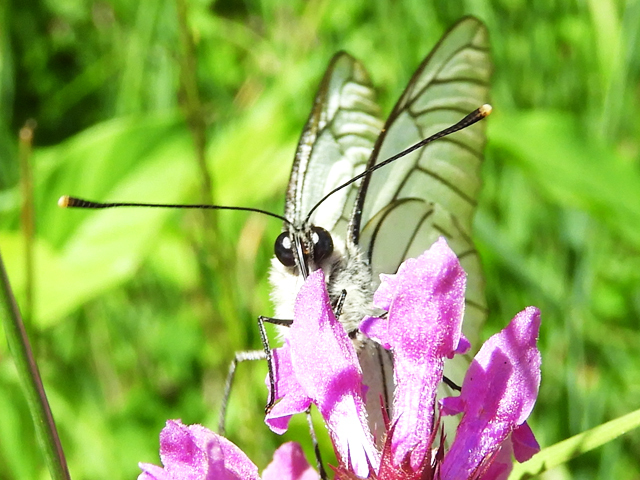 The Elephant Hawkmoth is common throughout France, preferring open woodland, grassland areas and gardens where it enjoys feeding on Honeysuckles and Petunias. 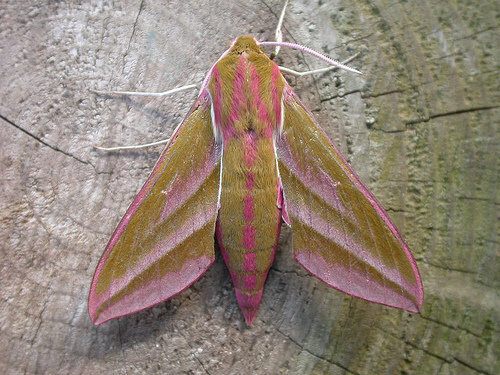 The moth has a wingspan of 50-70 mm and is a beautiful deep pink and olive colour. I’ve not been fortunate enough to see the moth yet, but I’ve included a photograph of one below for your reference. I’m hoping that now I have a happy, safe caterpillar in the garden that maybe next year I’ll be able to share my own photograph of the Elephant Hawkmoth with you! If you’ve been lucky enough to take a photograph of one or have seen one in your area, please let me know by leaving your comments in the box below. 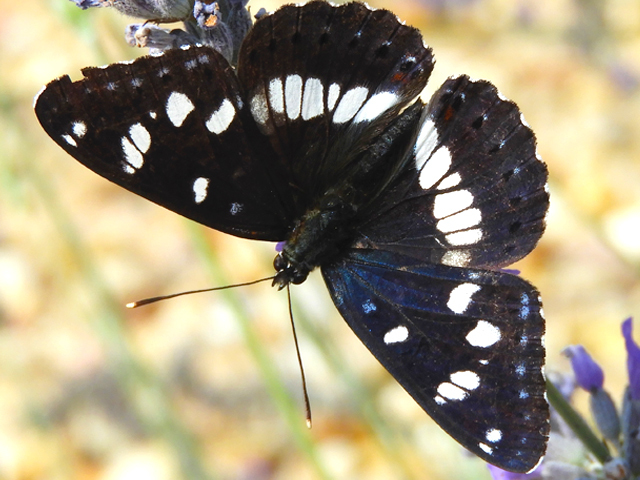 My parents have just found a huge one (8-9cm), changing colour and getting ready to pupate, down here in the Languedoc. It’s a bit late for it still to be out. It shows its dislike of the jar it was temporarily forced to inhabit by coiling up and springing out, and it also made a clicking noise. What a stunning looking moth, I’ve never seen one before but will be watching my honeysuckle closely! Just found one of these moths on our bedroom curtains – and, thanks to you, I was able to identify it! The colour is stunning – a rich magenta pink with a very pointy bottom. Probably about five centimeters long. I’ve taken lots of photos -( a bit tricky holding the curtain with one hand whilst trying to lift the moth into the sunlight to photograph). I have honeysuckle on our veranda below. Every year our cats bring in huge, unusual, snake-like caterpillars which I thought were hawk moth but perhaps they were these special elephant hawk moths. Will watch for more!